SchemeEddy is a powerful scheme editor, written by Etho. It is compatible with W:A and WWP schemes, as well as with W:A's new scheme format (which allows setting super weapon ammo), and thus can convert schemes between formats. 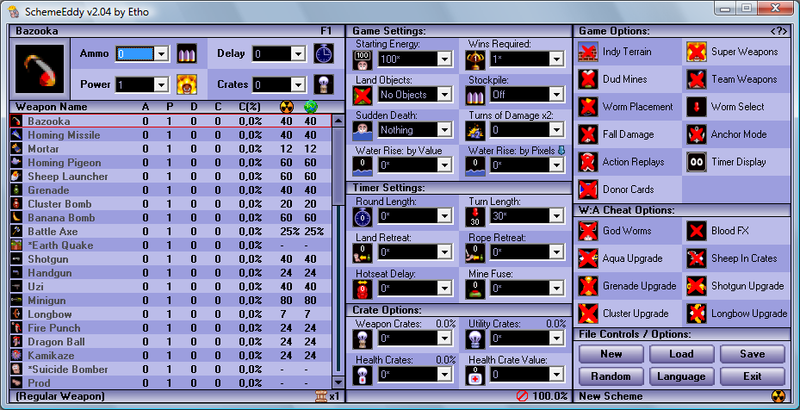 It is currently the most advanced scheme editor, allowing you to set any value the game will tolerate (beyond the default limits) for scheme parameters and can even generate random schemes. As of version 2.06, it also supports the new scheme options introduced in the v3.6.29.0 Beta update.